The Maui Zipline Company at the Maui Tropical Plantation announced a partnership with Big Brothers Big Sisters of Maui that will offer free zipline activities for participants enrolled in the organization’s community and school based mentoring programs this month. “It’s an honor to help Big Brothers Big Sisters,” said owners of the Maui Zipline Company in a statement, expressing support for children’s health and education. “This important non-profit is vital to the community of Maui and benefits our children. 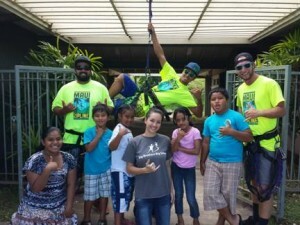 By partnering with them we hope to be a small part of enhancing their lives,” Maui Zipline Company owners said. JD Wyatt, director of Big Brothers Big Sisters of Maui thanked the company for gift to the volunteers and children involved in the program. “Many of our kids do not have the opportunity to enjoy such a fun and exciting experience that Maui Zipline offers, and we know it will be the highlight of their year. On behalf of my staff and board, we can’t thank Maui Zipline enough for one of the largest in-kind donations our agency has ever received,” said Wyatt in a press release statement. As part of the Big Brothers Big Sisters of Maui Community-Based Mentoring program, children and mentors meet one-on-one in the community on their own time. Organization leaders say each match is supported by an agency case manager to make sure the relationship is safe and productive. The organization’s School-Based Mentoring program enables children and mentors to meet one-on-one in a classroom setting once per week after school, with activities facilitated through agency case managers on-site.